At the 2012 "Five-Star Hainan Airlines, Beauty of Oriental Airlines" themed awarding ceremony that was held at Tangla Beijing on the night of March 28, Hainan Airlines was again awarded Skytrax’s Five-Star Airline of the Year award. 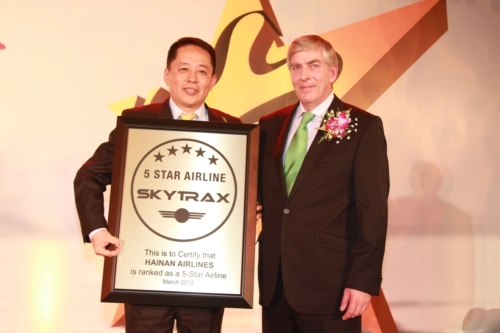 Skytrax Chairman Edward Plaisted once again presented the Skytrax Five-Star Airline certificate to Hainan Airlines Chairman Chen Ming. This is the second consecutive year for Hainan Airlines, mainland China’s only Skytrax Five-Star Airline, to win the award, making it one of the leading airlines worldwide with state-of-the-art services. With its unique service quality, Hainan Airlines has received affirmation from the western authoritative rating firm, showcasing the value and beauty of the airline from the orient to the rest of the world. Skytrax’s yearly issued reports, including airline and airport rating reports, are a widely recognized and respected evaluation of the quality of airline services and have become a globally recognized mark for the quality of airlines’ products and services. Commenting on Hainan Airlines’ receipt of the award once again, Skytrax Chairman Edward Plaisted said, "After becoming the first airline in mainland China to be awarded the honor in 2011, Hainan Airlines has continuously enhanced the quality of services, including cabin and ground services, while maintaining high standards in service as a five-star airline. For this reason, Skytrax decided to award the title of the ‘Five-Star Airline of the Year’ to the airline again." As one of China’s four largest airlines, Hainan Airlines has been operating in accordance with the requirements of the modern enterprise system since its inception, making innovations in and attempts on the concept of service and the model of operation and management. The airline has been running safely for 19 years during which it has maintained a good record of safety performance, while its service quality has been recognized by a number of passengers and the civil aviation industry. It is noteworthy that Hainan Airlines released its service idea — the essence of the Five-Star Airline — for the first time at this year’s grand awards ceremony. The idea embraces a service vision of "Hainan Airlines, Changing Expectation" and core "SMILE" service standards, including Safety & Punctuality, Manners & Elegance, Innovation & Passion, Leadership & Teamwork and Equality & Love.